Home safes can protect your valuables from intruders, and from damage caused by fire and flooding. Choosing the right model for your needs can be difficult and time-consuming. The ReviewLab team has made that job easier for you by conducting extensive research on different home safes. Here, you’ll find detailed information on freestanding, wall and diversion safes. 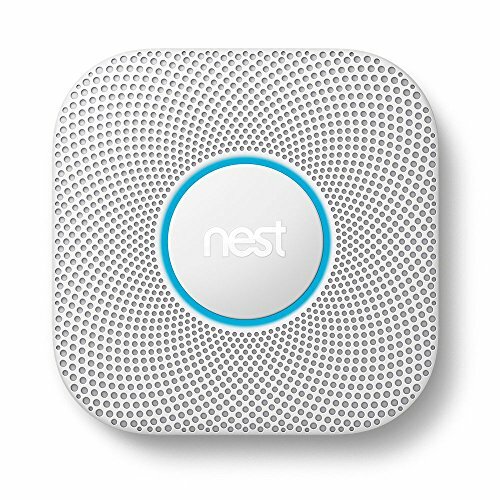 Each home safe in our list includes its top features, specifications and more. Our buying guide includes key considerations and a price breakdown that will help you make an informed decision on which home safe is best for you. Read more about our methodology. 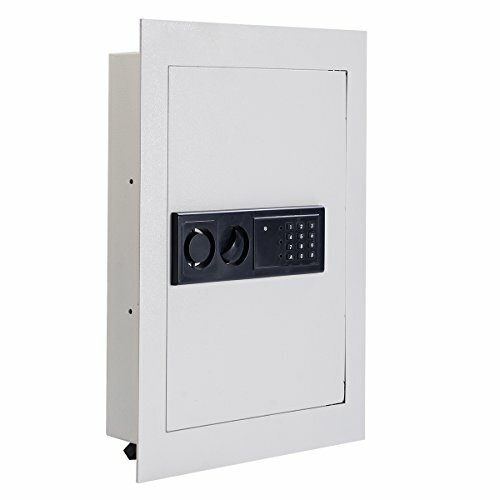 The SereneLife Fireproof Safe Box is solidly constructed with reinforced steel walls and dual security steel door locking bolts. Other features, such as opening the safe with either the fingerprint sensor or a key, makes this home safe a ReviewLab top choice for securing all your valuables. The Stack-On PS-1508 Strong Box Safe is a great choice to store valuables such as documents, jewelry, and guns, and the extra-wide size will also accommodate your laptop. This and other features, such as the dual locking system, makes this model another ReviewLab top pick. The SentrySafe Fire Resistant Chest is a great choice not only for the budget-minded shopper, but for anyone looking for a secure home safe. 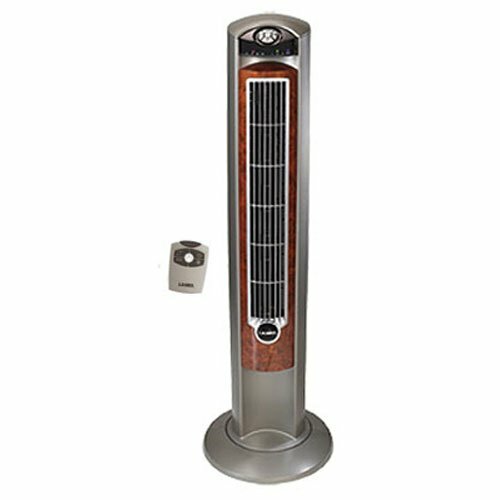 Along with other excellent features, this SentrySafe model will protect your valuables for one-half hour in temperatures up to 1550°F. The Finnkare Safe Lock Box is another great choice for a home safe that’s kind to your wallet while providing the security you need. Such features as heavy gauge steel construction and a cable rated at 1500 pounds make this a secure safe for storing guns, jewelry, passports and cash. The Adir Security Safe is a great choice for a freestanding safe that will securely protect your valuables, such as passports, jewelry and cash. To lock and unlock this safe, use your personal programmable passcode or, for a manual override, you can use a key. The Zeny Digital Security Safe Box is a great choice to store your handguns and other small valuables such as jewelry, cash and important documents. This freestanding home safe includes both electronic and keyed locking systems, and can be anchored to the floor or wall. The Stack-On Wall Safe is an excellent choice if you want your valuables well hidden from potential burglars. With the removable shelves, you can store a variety of valuables, such as guns, documents and jewelry. And you have two choices for locking/unlocking the safe: electronic or a manual key. 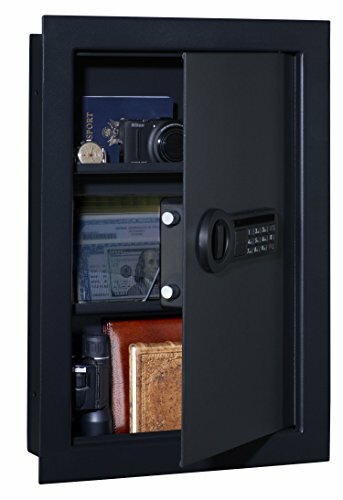 The Giantex Electronic Wall Safe will keep your valuables secure with its solid steel construction. The adjustable and removable shelves, along with other features, makes this a great choice for a wall safe that can be hidden from potential thieves. The Ohuhu Diversion Safe is a great choice to keep your valuables hidden from potential burglars. The outside looks like a dictionary, but the hidden steel safe ensures your jewelry, handguns, passports and other valuables are secure. Home-X Dictionary Diversion Book Safe is a great choice for a compact safe to store your valuables. This safe is small and light enough to keep in your car or take with you traveling or to your RV or boat. There are three common types of home safes: freestanding, wall and diversion. 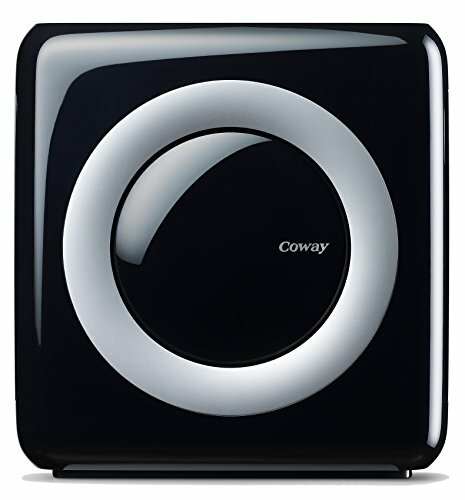 Freestanding home safes are among the most reliable. These safes may be fire and/or water-resistant, more secure than wall or diversion safes, have bolt holes to anchor it to your floor and come with different types of locking systems. Wall home safes are easy to hide behind a painting, or in a closet. They’re best used for documents and jewelry, since they typically aren’t built to hold heavy objects. Wall safes may be easier to break into than freestanding safes because they can be cut out of the wall. Also, wall safes typically aren’t fire resistant. Diversion home safes are just that: They are designed not to look like safes at all. Diversion safes come in many styles. The most common models look like books, and can be inconspicuously placed on a shelf. Diversion safes, like wall safes, are typically not fire resistant and are easier to break into. 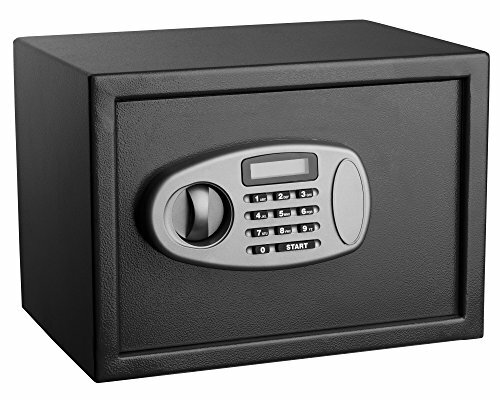 While all safes are designed to secure items against theft, others offer a higher degree of protection. Before purchasing a safe, you should consider whether you also want protection from fire and flooding. Many professional home safety experts recommend getting a larger safe than you think you need, since most people add more items to their safe over time. Another thing to consider, as far as size, is the weight and overall dimensions of the safe, should you plan to move it to different places. The type of locking system is another factor to consider. Key locks are simple to use, but they’re also the easiest to break into. Additionally, if you lose the key, you will need a locksmith to open the safe and rekey it. Digital locks typically have a small keypad. The owner enters a PIN to open the safe. This entry mode is quicker to open than a dial lock, which requires a combination. However, digital locks won’t work in a power outage, where dial locks will. The last type of lock system is biometric, in which the safe is opened by fingerprints stored in the locking system. These safes open easily, but also won’t work in a power outage. Diversion safes are typically the least expensive home safes priced at under $20. Freestanding safes and wall safes range from $50 to $400 or more, depending on features such as the quality of the construction, the size of the safe, and the type of locking system. 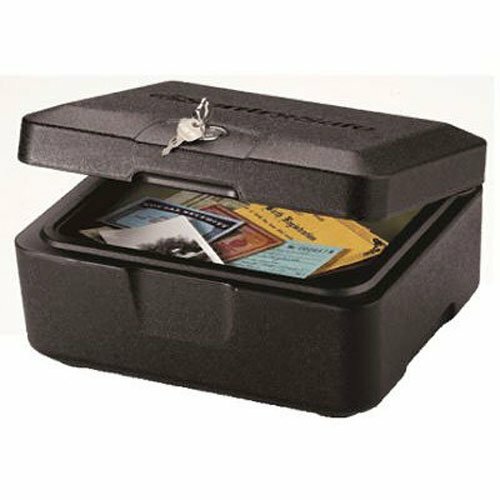 The SereneLife Fireproof Safe Box is a great choice for securely storing all your valuables, including guns, important documents, and jewelry. This safe in constructed with engineered, alloy steel, and has a corrosion-resistant powder-coat finish. The two steel locking bolts and the finger sensor technology add extra security. For convenience, the safe can also be opened with the digital keypad, or a key. All these features and more are why ReviewLab has chosen this SereneLife home safe as its top pick in home safes. Solid, fire resistant construction. The SereneLife Safe Box is constructed with engineered, alloy steel with a powder coat finish that’s corrosion and stain resistant. This safe will resist fire damage for approximately 30 minutes. The walls of the safe are 2mm thick (approximately 3/32”) and the door is 3mm thick (approximately 1/8”). Two heavy-duty locking bolts make it even tougher for would-be thieves to break into the safe. This safe has holes for mounting to the floor or the wall. The mounting bolts are included with purchase. Large enough for many valuables. The SereneLife home safe measures 13.8” long x 9.8” wide x 9.8” high. Users say this safe is large enough to store all their valuables, including guns, important documents, and jewelry. Multiple methods for locking. This SereneLife model includes three ways to lock and unlock your safe. The secure, biometric method uses your unique thumbprint to open the safe. You can also enter a secret code on the digital keypad, or as a final, mechanical backup, two keys are provided. Also included with your purchase are four AA batteries. For added convenience, an LED indicator will let you know when your batteries are running low. No shelf. A few users say they wanted this safe to include an interior shelf. The Stack-On PS-1508 Strong Box Safe is large enough to hold your laptop, guns, documents and jewelry. Use the safe’s pre-drilled holes to mount it to the floor, shelf or wall, or keep it available to carry to different rooms or bring with you when you travel. The solid construction, live steel locking bolts, and concealed hinges provide extra security. These features and more make the Stack-On home safe a great choice to securely store all your valuables. Solid construction. 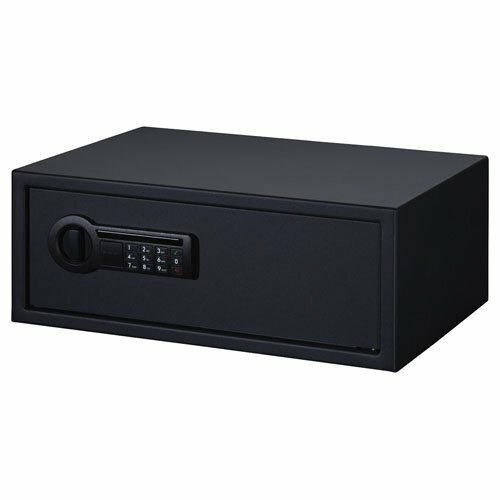 The Stack-On PS-1508 Strong Box Safe is constructed of solid steel, including pry-resistant, steel plate doors. Dual, steel, live locking bolts and concealed hinges provide additional security. The design includes pre-drilled holes to mount the safe to the floor, a shelf, or the wall, and the mounting hardware is included. The quality of this safe is praised by reviewers. Extra-large size. This Stack-On safe box is large enough to hold all your valuables, including your laptop. The interior dimensions are 20.25” long x 12” wide x 7.5” high. Dual locking system. The Stack-On PS-1508 has two methods of locking and unlocking the safe. You can easily program the electronic lock with your own combination by pressing the button on the back of the door. For extra security, there’s a timeout period after three incorrect combination attempts. A key is included as a manual backup in case you forget your combination, or if the batteries lose power. Four AA batteries are also included with your purchase. Small mounting holes. One complaint is that the mounting holes aren’t large enough (7.5mm or .3”). The SentrySafe Fire Resistant Chest has some great features at an affordable price, making this an excellent choice for the budget-minded shopper. You’ll have peace of mind knowing your valuables are secure with this home safe’s fire resistance rating of one-half hour up to 1550°F. The small size and carrying grips will let you easily take valuables with you, a nice option for traveling with jewelry, passport or USB drives. Fire resistant. 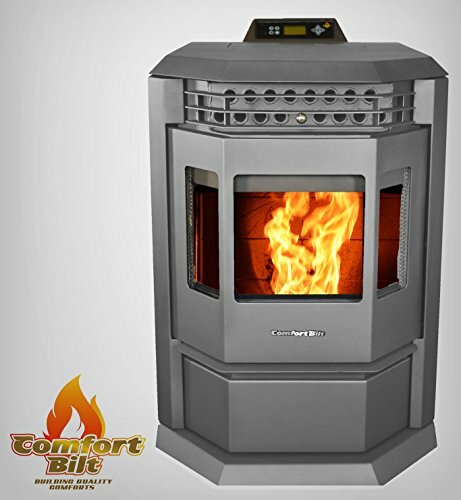 This SentrySafe home safe is UL certified to endure a fire of up to 1550°F (843°C) for one-half hour. This safe is also ETL verified to protect CDs, DVDs, memory sticks and USB drives for the same rating of one-half hour at 1550°F. The ETL Mark is proof of product compliance to North American safety standards. Several users comment on the good quality of this safe. Portable. This SentrySafe model’s size and carrying grips make it convenient to store anywhere in your house, and is compact enough to be portable. The exterior dimensions are 12.2” long x 10.3” wide x 6.1” high, and the interior dimensions are 9.7” long x 7.3” wide x 3.8” high. Warranty. SentrySafe offers a Lifetime After-Fire Replacement warranty. If this safe is damaged by fire at any time, and the safe is with the original owner, they will replace it free of charge. No handles. Though this safe has carrying grips, some users wish that it also had handles. The Finnkare Safe Lock Box, constructed of heavy gauge steel, is a secure home safe in which to store all your valuables, including guns, jewelry, important documents and cash. A cable rated at 1500 pounds is included with your purchase, adding an extra level of security. 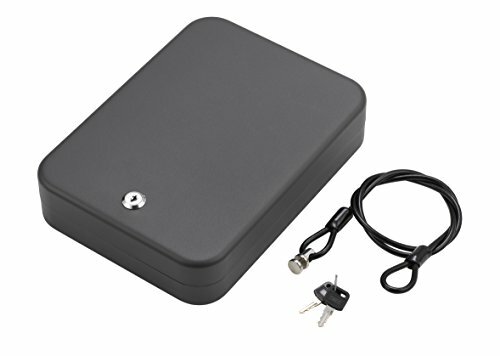 Other features, such as memory foam to protect the safe contents from scratches or dents, make the Finnkare Safe Lock Box a great choice for a low-cost, secure home safe. Solid construction. 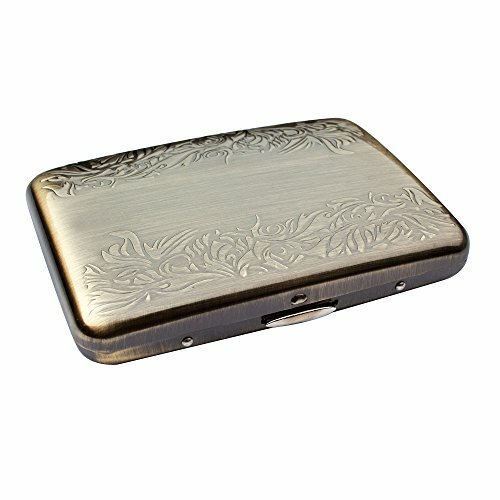 With this Finnkare model, you’ll have the peace of mind knowing your valuables, including guns, jewelry and important documents are securely stored with its construction of 16-gauge steel, which is approximately 1/16” thick. Portable. The Finnkare Safe Lock Box is small enough to take with you, but large enough to store a gun and other valuables. The interior of this safe is lined with memory foam, which will protect your valuables from scratches or dents. Cable for extra security. Included with your purchase is a cable with a 1,500 pound rating, providing extra security. Some reviewers say they use the cable to attach the box to such things as a motorcycle frame or bed frame. Stiff key. One complaint is that the key and lock are a little stiff to operate. Freestanding safes are the most common type of home safe. You can place the safe anywhere in your home, and some models feature bolt holes, to anchor the safe to the floor. They come in a variety of sizes, and different levels of security and locking systems are available. The Adir Security Safe is a great choice if you’re looking for a home safe that can be stored in any room in your house. The design includes mounting holes so you can anchor the safe to the floor, a wall or a shelf, and the mounting bolts are included. The dual locking system lets you lock and unlock the safe with a key or by entering your personalized passcode on the keypad. The Adir home safe will provide secure storage for such valuables as important documents, jewelry and cash. Sturdy construction. The Adir Security Safe’s door is constructed with 4mm thick steel (.16”), and the walls are 2mm think (.08”). For added protection, the door has two live bolts and pry-resistant concealed hinges. Dual Locking System. With this Adir safe, you can use either the electronic lock or a key. To use the electronic lock, you program the safe with your personalized passcode, enter it on the keypad, and then simply turn the doorknob. Several users comment how easy it is to program the personalized code. A digital display shows the lock status: locked, unlocked or low battery. If you forget your passcode or the batteries die, you can use a key to open the safe. Two AA batteries and two keys are included with your purchase. Holes for securing to wall, floor or shelf. To make sure your safe isn’t carried off by a thief, the Adir Security Safe has mounting holes to anchor it to the floor, a shelf or a wall, and the bolts are included. Size. This safe is .5 cubic feet, approximate interior dimensions: 9.25” wide x 8.25” deep x 13.25” high. With the Zeny Digital Security Safe Box, you can feel confident that your prized possessions will be securely stored. The steel safe includes tamper-proof hinges hidden inside the safe and has a durable powder-coat finish. The electronic lock is easy to program and to operate, and as a backup, you can also lock and unlock the safe with a key. These and other features make this Zeny home safe a great choice for storing all your valuables, including guns, jewelry, important documents and cash. Sturdy construction. 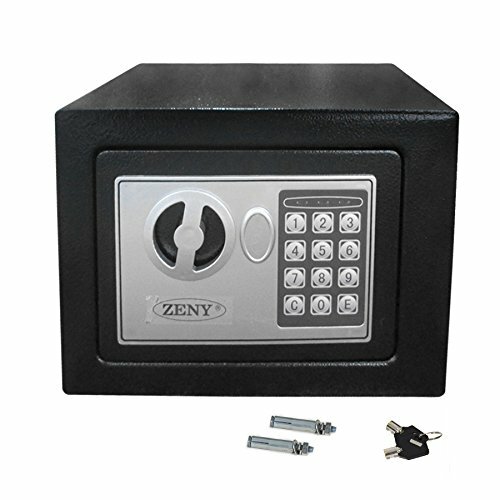 The Zeny safe box is constructed with a 4mm (.16”) thick steel door, 2mm (.08”) thick walls and a .75” door bolt. The hinges are hidden inside the safe so they can’t be pried apart. The outside of the safe has a durable, powder-coat finish, and pre-drilled holes in the back of the safe allow you to anchor it to the floor, a shelf or a wall. The bolts are included with your purchase. Dual Locking System. This Zeny model has two methods for locking and unlocking the safe. You can use the electronic lock by programming a passcode and entering it on the keypad. A timeout period is activated if three incorrect combinations are attempted. You can also use a key, which is handy if you forget your passcode or the batteries run down. The key lock is hidden, and two keys are included. An LED display shows the security and battery power status. Holds handguns, other valuables. A few reviewers are happy with this safe to store their small handguns, as well as jewelry, cash and other personal items. Batteries not included. The two AA batteries required to operate the electronic lock are not included with your purchase. Wall home safes can be concealed behind paintings, in closets or other hidden places in your home. While these safes are a good place to store documents and other paperwork, wall safes typically aren’t designed to hold heavy items. The Stack-On Wall Safe is a great choice for storing a variety of possessions. The shelves can be removed and barrel rests adjusted to accommodate guns, ammo, documents, jewelry, or other valuables. This wall safe is sized to fit between 2x4 wall studs on 16-inch centers. Once installed, the safe is almost flush with the wall, so you can hang a painting, tapestry or other decoration over the safe. With its solid steel construction, the Stack-On Wall Safe will ensure that your valuables are secure. Solid construction. The Stack-On Wall Safe has a steel, pry-resistant door with concealed hinges, an extra-thick steel locking plate and two steel live locking bolts. The safe is designed to fit between 2x4 studs on 16-inch centers. Mounting hardware is included. Several users say they’re pleased with the quality construction of this safe. Dual locking system. This Stack-On Wall Safe can be locked and unlocked using either the electronic lock or a key. The electronic lock is programmed with your own unique passcode. The keypad beeps when pressed, but this feature can be turned off. And in case you lose your passcode or the batteries run down, you can use a key. This safe also has a low battery warning system. Four AA batteries are included with your purchase. 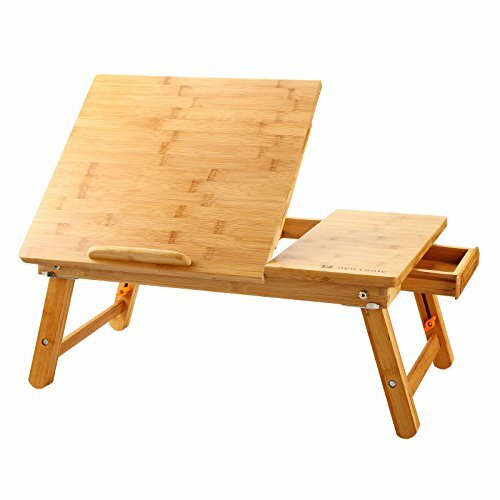 Capacity; adjustable barrel rests; removable shelves. The interior dimensions of this wall safe are 13.66" wide x 20.51" high x 3.09" deep. The bottom and shelves are padded, and the shelves can be removed and barrel rests adjusted to store guns and ammo. Door not reversible. The Stack-On Wall Safe door only opens to the right, and a few reviewers say they wish the door was reversible. The Giantex Electronic Wall Safe is an excellent choice for not only storing your valuables, but also concealing the safe. This safe will be almost flush with the wall once it’s installed, and you can hide it behind a painting or another type of wall hanging. You can also install it in your closet or behind a bookshelf. The safe includes shelves to store a variety of your prized possessions, or you can remove the shelves to accommodate larger items. Durable construction. The Giantex Wall Safe is constructed with 2mm (.08”) thick steel on the walls and 4mm thick steel on the door, and the internal hinges are tamper-proof. The safe has a durable powder-coat finish. Mounting hardware is included. Several users comment that the included instructions made the installation easy. Dual locking system. 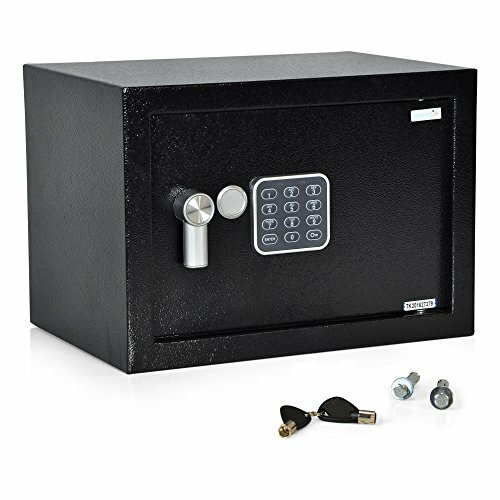 You can lock and unlock this Giantex wall safe with either the electronic lock using your secret combination or with a key. A timeout period is programmed into the electronic lock that’s activated after three incorrect combination attempts. Four AA batteries and two keys are included. Capacity; adjustable and removable shelves. The inside of this safe measures 19" high x 14" wide x 3-3/4" deep. Use the adjustable shelves to store a variety of your valuables. Or you can remove the shelves to store larger items, such as guns. No cutout template. One concern is that a cutout template to help with installation is not included. To the common eye, diversion home safes don’t appear to be a safe, so burglars pass them by. Common diversion safes include models that look like soda cans, tissue boxes, or household products. The most common diversion home safes are book lookalikes. Place the Ohuhu Diversion Book Safe on a bookshelf and any potential burglar won’t give it a second look. The outside of the safe is a real hardback book cover. Inside is a fire resistant steel safe large enough to store a handgun and other valuables, such as jewelry, cash and important documents. Locking and unlocking the safe is easy with the three-number dial combination lock. 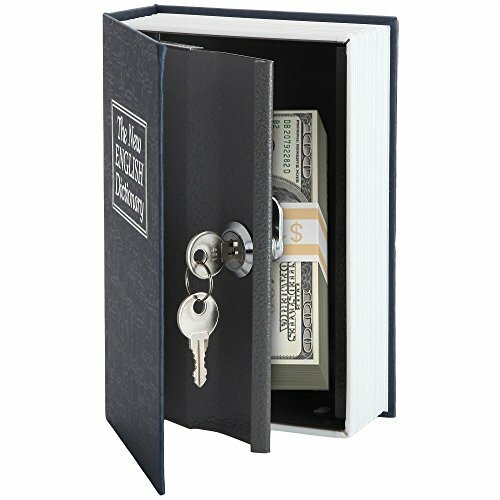 All these features and more make this Ohuhu Diversion Book Safe a great choice to conceal and secure your valuables. Fire resistant safe. The solid steel safe that’s hidden inside the hardback cover of the Ohuhu Diversion Book Safe is fire resistant, providing an extra level of security for your valuables. Large enough to store handgun, other valuables. The Ohuhu Diversion Safe measures 9.5" long x 6.1" wide x 2.2" high, large enough to store a handgun along with other valuables. No manual key override. This safe does not have a backup key, should you forget your three-number combination. Home-X Dictionary Diversion Book Safe is a great choice to safely store your valuables. This safe will blend in with your other books and go unnoticed by potential thieves. 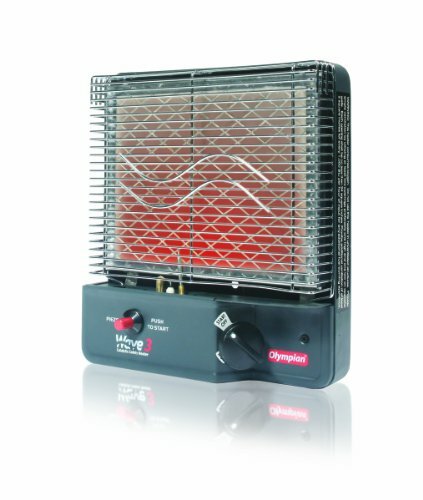 It’s also small and light enough to take with you whether you’re traveling by air, car, RV or boat. And since it’s disguised as a dictionary, you can safely store your passport, cash, jewelry, credit cards and other items with no one the wiser. The Home-X Dictionary Diversion Book Safe is a clever and convenient way to make sure your valuables are secure. Blends in on a bookshelf. This Home-X safe looks like a dictionary and is effectively disguised to deter potential thieves. 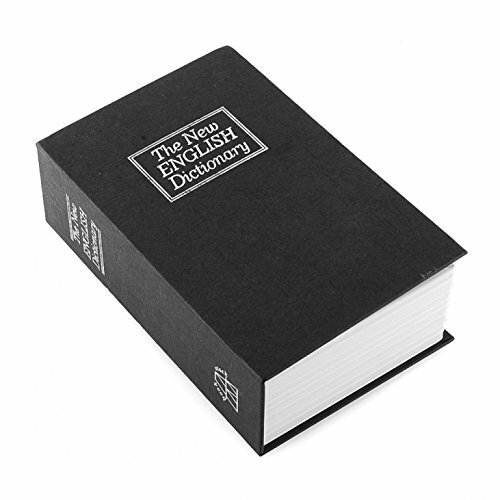 The outside of the safe is made to resemble a hardback book cover and the words “The New English Dictionary” are embossed on the cover and the spine, so it blends in with other books on your shelf. Sized for travel. The Home-X Dictionary Diversion Book Safe is small enough to take with you when you travel, yet large enough to store passports, jewelry, cash, credit cards and other items. This book safe weighs 1.2 pounds. The outside dimensions are 7.25” long x 4.5” wide x 2” high. The inside of the safe measures 6.5” long x 4” wide x 1.5” high. Convenient. Unlike many other safes, which can be heavy and cumbersome to lift, you can conveniently move the Home-X safe from room to room and can place it on a bookshelf, table or desk. Many reviewers say they like this safe not only for themselves, but their kids love it, too. No electronic lock. This diversion safe can only be locked and unlocked with a key. Two keys are included.